The #FOIACakes lawsuit finally has its day in court: Wednesday, December 14th, although it’s unclear exactly why. Since at least mid-August (if not earlier), Capitol Hill East ANC commissioner Denise Rucker Krepp has possessed the very DC prosecution data she originally sought and sued to get, but her lawsuit against the Department of Justice still continues. Barred in DC has obtained (this sounds dramatic but I just signed up for a PACER account and paid $15 or so to download the documents) this data and is posting it here for the public (including Krepp’s neighbors and local businesses who contributed nearly $1900 to cover FOIA fees that never existed in the first place). The data includes prosecution statistics (including convictions and guilty pleas) for various crimes from 2010-2015, overall and sorted by the seven DC police districts (maps of DC police districts can be found here). Analyze yourself to draw your own conclusions about DC’s prosecutions (or lack of). Krepp apparently received the data after DOJ provided it to the Senate Judiciary Committee on July 15th (The Committee requested it in May and June after the lawsuit was filed). Krepp says she’s still in court because DOJ has yet to give documents directly to her, and that Barred in DC could have asked for the statistics directly from her. Krepp sued DOJ in May when DOJ failed to release detailed statistics about arrests and prosecutions in DC in response to Krepp’s FOIA request and appeal. 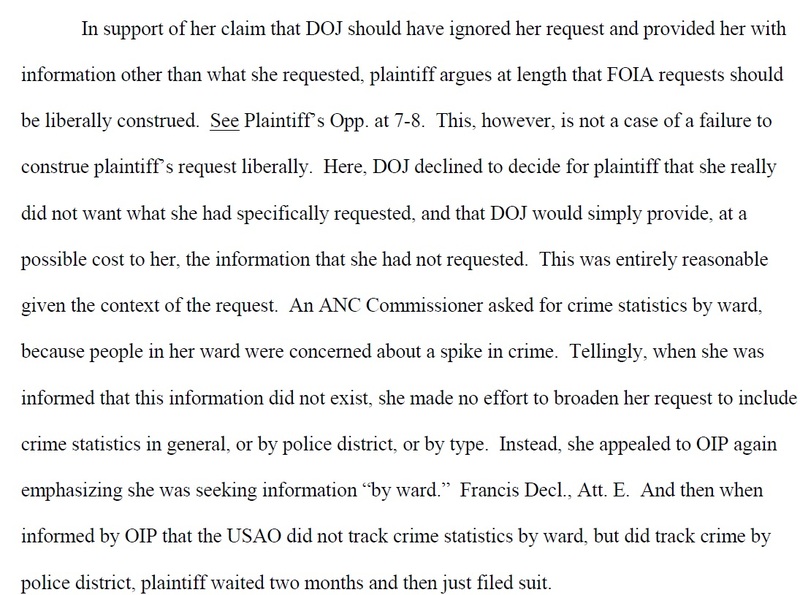 Because Krepp asked for the data by ward, and DOJ only maintains the info by police service area or district, DOJ said it didn’t have the data she asked for, but suggested that she file another request for data it actually had. Wednesday’s hearing is regarding DOJ’s motion for summary judgment (essentially that the facts aren’t in dispute and the judge just needs to make a legal ruling); most, if not all, FOIA lawsuits are settled by motions for summary judgment, not a full blown trial. DOJ filed this motion on August 4th, Krepp’s attorneys opposed on August 17th, and DOJ responded on October 3rd. Indeed, Krepp’s lawyer, Jay Williams (chair of the ANC alcohol subcommittee covering most H Street bars-see there is a connection to DC bars after all,) forcefully argues (and rightfully, in my opinion) that DOJ failed to reasonably interpret Krepp’s request in the first place, contrary to judicial precedent, DOJ FOIA policy, and President’s own proclamations. DOJ argues that Krepp clearly only wanted information about wards so it reasonably interpreted the request. I don’t buy it. Less convincing is Williams’ contentions that DOJ treated the request from the Chairman of the Senate Judiciary Committee, the “powerful” Senator Grassley, differently than an average citizen (Krepp), primarily to ingratiate itself with Congress to push through the confirmation of the nominee for DC US Attorney, Channing D. Phillips. Although DOJ for some reason did not argue this in its filings, the requests from Committee and the replies from DOJ aren’t even covered by FOIA. Although individual Congressmen must be treated like any other FOIA requester, FOIA doesn’t apply to requests made by Congressional committees acting through its chairman, as was done here. Federal agencies provide information to Congress (but not necessarily individual Congressmen) all the time outside FOIA, and it’s totally legal. Again, given that Krepp now has the information she’s asked for and DOJ might get a judicial opinion restricting its ability to narrowly construe requests, it’s not clear why the lawsuit continues (perhaps attorney’s fees, the principle of the whole case-how to interpret FOIA requests, and/or the optics of being able to say that you fought the law and you won are all reasons). Barred in DC will keep you updated, whether you like it or care or not. In the interests of some disclosure, a significant part of my job at the federal agency I work at involves FOIA, so the results of any litigation could theoretically affect the work I do. The views stated above are, of course, my own personal views and do not constitute the views of the U.S. Government. I’m also a resident member of the ANC6B alcohol subcommittee.